What is laser therapy (LT)? 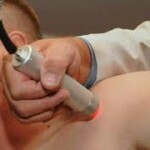 Low-level LT is the type of laser that is used commonly in physiotherapy. Laser will have an effect of the cellular activity at the site of an injury, which will have an effect on reducing pain, inflammations and improve cell growth and thus repair of damaged tissue. Low-level LT is used on acute and chronic soft tissue injuries commonly seen in sporting injuries and in relieving painful trigger point knows seen in back and neck pain. What are its benefits of LT? What conditions are LT used for? If you think your condition may benefit from the use of laser therapy, please ask your physiotherapist.